I thought it might be interesting to post this article which was written over twenty years ago by John Soet, who was an editor for Inside Kung Fu magazine. This came from the Bruce Lee special magazine released October 1990. I knew John personally, and although I do not agree with everything he wrote in this and other articles, one can see how the fog of mis-perception concerning Bruce Lee and JKD have been around for decades. Anyway, read it and let me know what you think. Editor’s Note: I would like to make it clear that although I knew Bruce Lee, I was not an intimate acquaintance. I had the privilege of him showing me some techniques, or how to improve my own technique. I do not claim to have studied with him and, to my knowledge, he had no students in his final days. 1. Bruce Lee was a paper dragon. His fighting was based on theory and private sparring, but he never really fought. REALITY: Bruce Lee never backed away from a fight in his life. This myth was started by tournament fighters, who claimed Bruce Lee never entered a tournament. In the sixties, tournaments were no contact or light contact. They were like games of tag. Bruce felt that such tournaments made about as much sense as target shooting with an empty gun. The sum total of Bruce’s personal training was for reality. He grew up in the tough streets of Hong Kong and was the veteran of many streetfights, whereas many of today’s champions freely admit they have never been in a real fight. I particularly get a kick out of some well-known tournament fighters who tiptoed around him when he was alive who today imply that they could have taken him. 2. Bruce Lee started jeet kune do after he got beaten up by a rival kung-fu instructor. with little variation. There was pressure from the Chinese community on Bruce not to teach Caucasians. Furthermore, he was establishing a reputation for himself and was very outspoken. A challenge was issued to Bruce and he accepted. In the ensuing fight, neither one really could be said to have beaten the other one up, but according to witnesses Bruce ended up chasing the opponent around the room, punching him in the back, until the fight was stopped. The opponent was an instructor of a very effective long-range style, and Bruce was using techniques from wing chun, an infighting style. The techniques of the two styles were incompatible, and they were literally cancelling each other out. That’s when he realized that rigid adherence to a style cost him the fight, and the seed of the concept of liberation from style first began to sprout. 3. Dan Inosanto became Bruce Lee’s follower after Bruce beat him up. REALITY: During Ed Parker’s 1964 Internationals in Long Beach, California, Dan was competing. He made a move that should have scored, but wasn’t counted. After the match, Bruce approached him and said, “That should have been a point; I saw it. Your hands were too fast for the judge’s eyes. He couldn’t see the move.” Later on, Ed Parker assigned Dan to be Bruce’s host in Los Angeles, and a lifetime friendship began. 4. 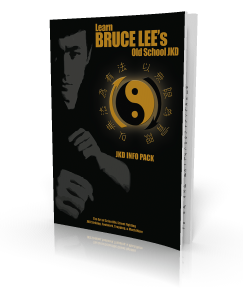 Bruce Lee formulated his own system because he knew he could never become grandmaster of the wing chun system. REALITY: It’s true he never completed his wing chun training, but wing chun is the most widely practiced style in Hong Kong today largely because of Bruce Lee’s fame. The reason he didn’t complete his training was because he had to leave Hong Kong to come to the United States. There was no one in the United States at the time under which he could pursue his studies. The entire formulation of his jeet kune do concepts took place when he was living in the United States. After The Green Hornet, he had the means to return to Hong Kong had he wanted to continue his wing chun studies. 5. Chuck Norris taught Bruce Lee his kicks. REALITY: Bruce demonstrated his incredible arsenal of kicks in 1964, before he met Chuck. It’s recorded on film. Any competent martial artist can observe the two men and see that Chuck’s kicks are obviously Korean in origin, where the leg is tucked and chambered and the power is generated with a snap of the hip, twist of the support foot, and a rapid retraction. Bruce’s kicks, as you can see in any of his films, are of the Chinese method, originating from the floor without chambering, generating power by remaining relaxed and then snapping at impact, like cracking a whip, and following through without retraction. 6. Jeet kune do is now being widely taught. REALITY: What’s happening now is a rather humorous polarization. There are some people with a very, very limited knowledge of JKD tacking the name of JKD onto what they teach to get the Bruce Lee association in there to attract students. Then, on the other hand, you’ve got some people with an extensive knowledge of JKD who are actually teaching it, but they are teaching another art with JKD concepts incorporated into their application. A good rule of thumb is the more often a person uses the term JKD in conversation, seminars, articles, promotional material, etc., the less he knows. The less he uses the name or the more reluctant he is to use the name, the more he knows. 7. The Tao of Jeet Kune Do was authored by Bruce Lee. REALITY: In 1967, in an interview with a magazine, Bruce announced his intention to write a book on his art entitled The Tao of Jeet Kune Do. In the ensuing years, as his focus expanded, he abandoned the idea and was quite vocal about the fact that he had no intention of writing a book, it was conceptually impossible to formally create a text of something that was formless, and there would be no Tao. After his death, a publisher who had, during the early years of Bruce’s career, acquired certain unlimited rights to usage of name, materials, photographs, etc. published a compilation of Bruce’s notes under that title. Some of the notes were items he had directly copied out of other texts and no credit was given, in that they were his personal notes for his personal use. In my opinion, to call Bruce Lee the author of Tao is a bit of a reach. 8. To make him look faster than he really was, the filmmakers speeded up Bruce Lee. 9. Bruce Lee was a hashish addict, and finally died of a drug overdose. REALITY: This was started in the 1983 Penthouse article by Albert Goldman. Most readers don’t realize the work that goes into an article. First a writer has to find sources, then check the credibility of each source. If a person has a reason to smear a person or to lie, he’s called an impeachable source. Goldman interviewed many credible sources for the article, such as Dan Inosanto and Adrian Marshall, but for some reason he chose to focus on the statements of Bob Wall. There was a well-known altercation on the set of Enter the Dragon between Bob Wall and Bruce. Whether or not it was Wall’s intention to cast Bruce in a bad light, the fact that there had been war words between the two men would, to a good journalist, make him impeachable. At no time did Bruce appear intoxicated to me. Indeed, he seemed very crisp and alert and almost hyper, totally unlike a habitual user of a narcotic depressant. I would also like to add that although volumes of rebuttal letters were written to Penthouse, the only ones published were either in support of the article or those tinged with fanaticism and lunacy. The responsible letters attempting to tell the truth were not published. 10. Bruce Lee was hot-tempered and nasty. REALITY: He had a short fuse. There’s no question about it. But he was also the original Mr. Sensitive, and he had a knack for making you feel good about yourself. As a matter of fact, one of the ways to get to know him was to act down. He’d want to know what was wrong, and he’d give you a little pep talk, point up your strong points and always leave you feeling better. He was always for the underdog and he despised bullies. 11. If the things said about Bruce Lee were false, Linda Lee would have sued years ago. REALITY: Well, unfortunately she’s hamstrung by the system. Bela Lugosi’s son tried to sue over the exploitation of his father and it was ruled that a dead man can’t be defamed. Whether we agree or not, that’s the way the law’s written. 12. Bruce Lee was murdered. frequently complained of headaches. I personally think that the headaches were because he was obviously nearsighted and wouldn’t wear glasses. But there had been previous incidents of his passing out. His brain was swollen at the time of death, and the cerebral edema was evident. Why make of it more than it is? Howdy, i am Hana Guerero and I have to tell you that ” Twelve Myths About Bruce Lee | JKD London | Bruce Lee | Jeet Kune Do ” is without question an exceptional article.